I totally get how people feel when they receive a beautifully gift wrapped package. I like to wait hours to prolong the pleasure of unwrapping something so thoughtfully created and so I did. When I received my recent Etsy order from Mandy at A La Parisienne and finally opened the box ........oh, my goodness, a peacock feather. How gorgeous! 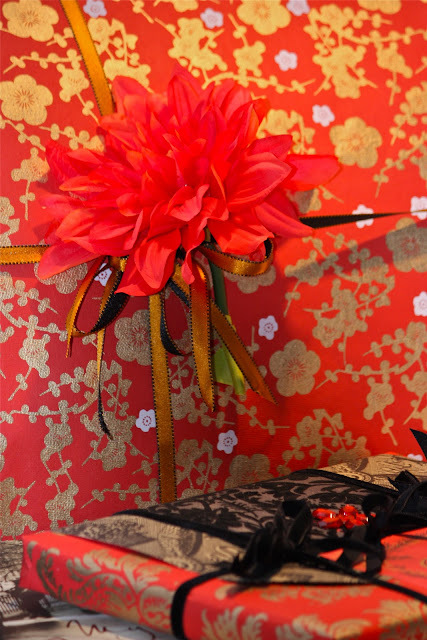 Such a fabulous embellishment.........wouldn't we have fun gift wrapping together? One of Mandy's feminine note cards from her Etsy shop in the background. 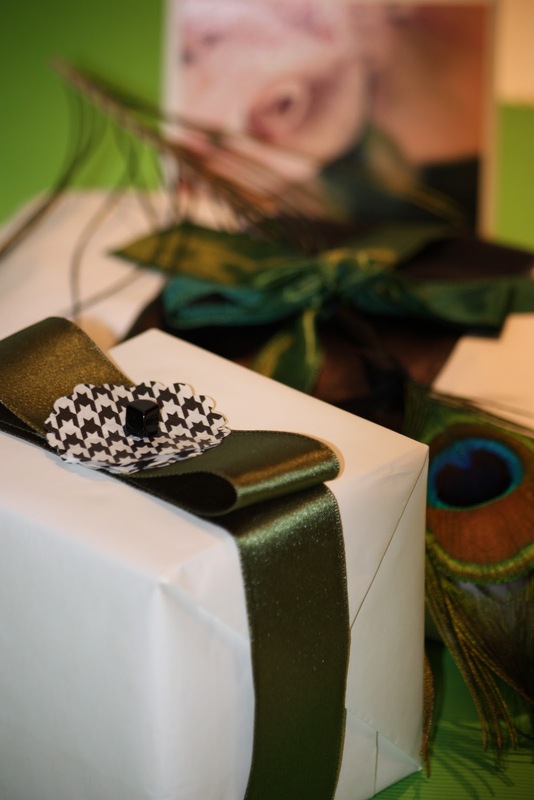 Simple white paper but so striking with green ribbon and the hounds tooth pattern. The same colour scheme, but each package styled differently. Doesn't Mandy prove my that gift wrapping point I am always trying to make? It's not what you use, it's how you use it. Though the peacock feather is most special I must say. Mandy used hounds tooth tissue paper to make these scalloped cut-outs and layered them into a petite embellishment. She sent me some extra so I could experiment with them, I can't quite think how I could do this any better. Something extra as well from my fellow blogger friend.........a thoughtful trio of her own Joyeux Noel photo postcards. I like the idea of sending these out soon, a bit of holiday beauty landing in some one's mailbox. Mandy has many beautiful things at her Etsy shop, always something new and clever. She recently introduced these genuine vintage fur collars and they reminded me of a stylish Parisian lady I saw in a Paris restaurant. My sister-in-law came back from the toilettes and said you have to go to the toilettes right now so you won't miss the lady in the corner table. You have to see this now. Wearing an elegant fur stole over a simple silk sheath, sparkly but discreet earrings, a wispy chignon, red lipstick, and sitting at the table with very erect posture, the elderly Parisian lady (with a bit of a Grey Garden look) owned the table that summer evening with her chic ensemble. I wanted to sit down at that table, ask her to tell me her story, I know she would have had a really good one. Doesn't everyone? 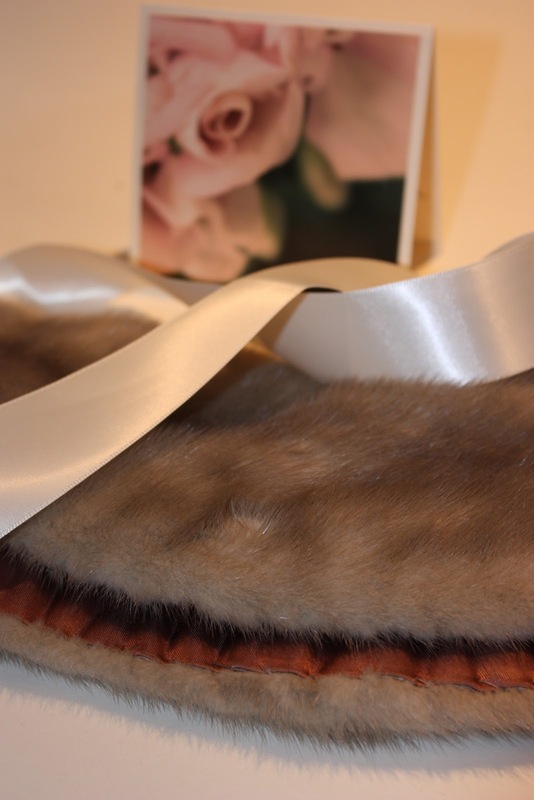 I adore my new (but vintage) fur collar from talented Mandy, it adds something to every outfit. I think I must wear it next weekend, the sooner the better. Sit up straighter, wear some red lipstick.........make up a chic little fashion story of my own. This the second try at capturing the essence of the Ralph Lauren store in Paris. 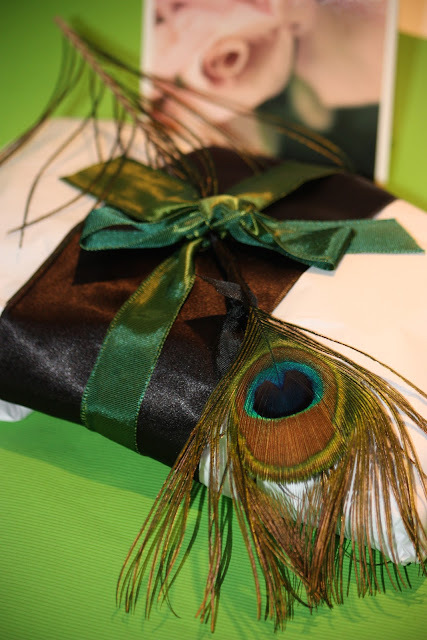 Just a little bit of gift wrapping fun today.........a nod to the interior designer that I was for 25 years. I say fun gift wrap, only because I doubt anyone could replicate this look exactly but you could come pretty close with another brooch style. This spectacular gilded "chair" pin is mine and whenever I run across it I think of those design days and how I loved a good chair. Today I am using it for demonstration purposes as I am not actually giving this away, I am not completely crazy. This one is a keeper. 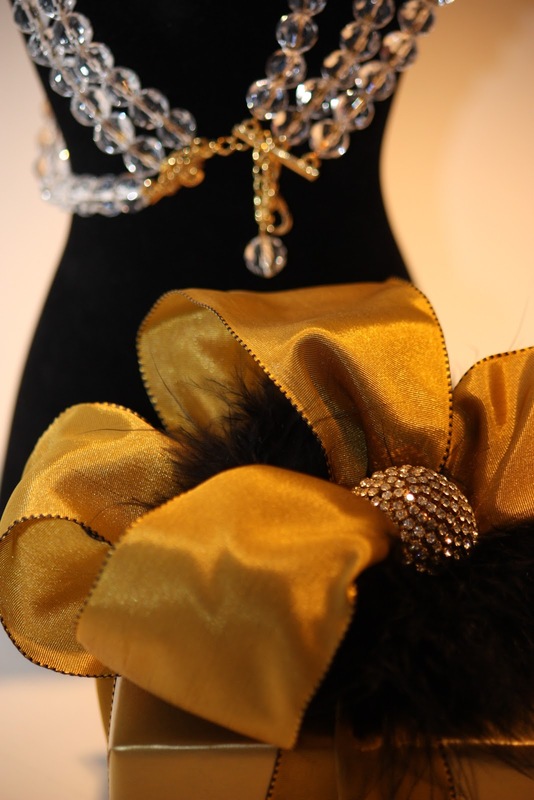 There are many brooches that can embellish a special gift presentation. Everyday I see costume jewelry that is very affordable and that can be used in this manner. The rear pin found on any brooch is what holds it in position on one of the ribbons. That easy. Shaped pins, chairs, cars, bows, animals, almost any thing you can think of so keep your eyes open. 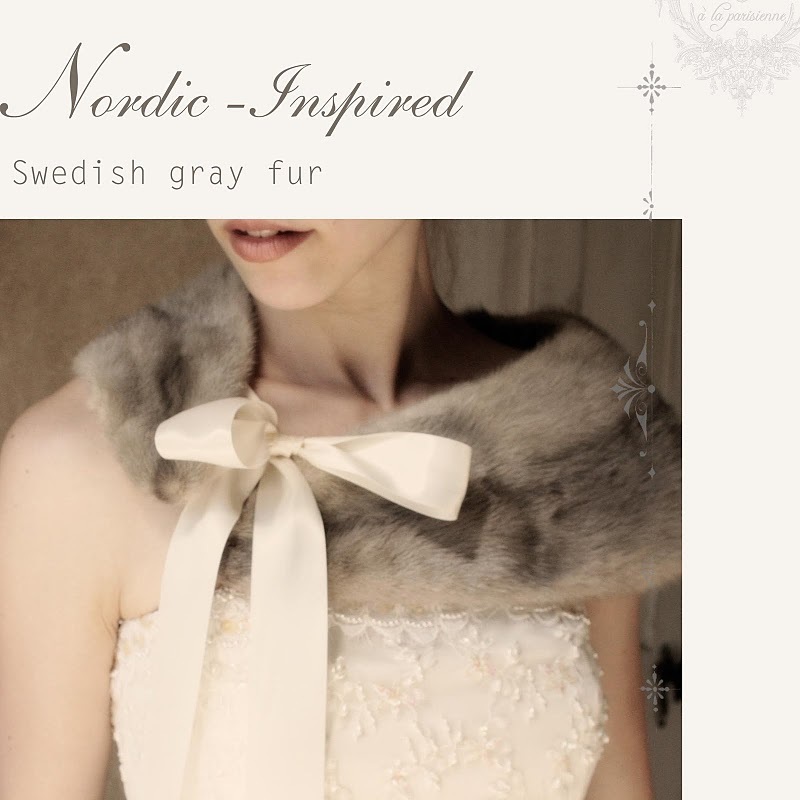 Select the brooch style that has personal meaning to your recipient. 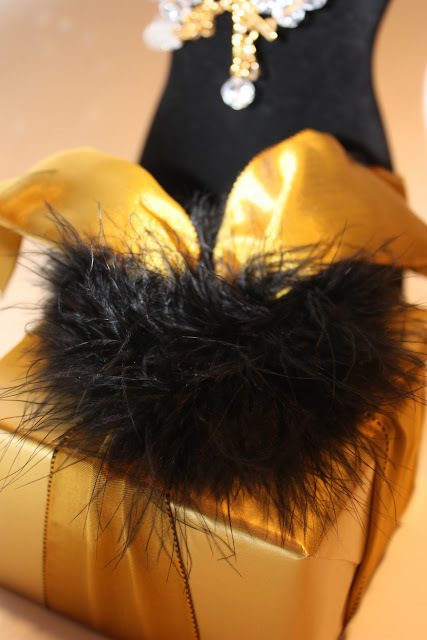 It does give the gift presentation a personal twist and won't you look clever? I guess the idea here is to be novel, use the "gift" as a part of the gift presentation, and use the scale to make it stand out more. Just my suggestion, but this idea seems to work best if you select a box not too much bigger than the the brooch embellishment itself. This was an Estee Lauder box that has a pretty little perfume compact inside. Two gifts in one. You know that you have walked into the most divine Parisian store when you open the doors to Cire Trudon. In fact, you are entering the shop of the oldest wax and candle manufacturer still in operation (see website history here). 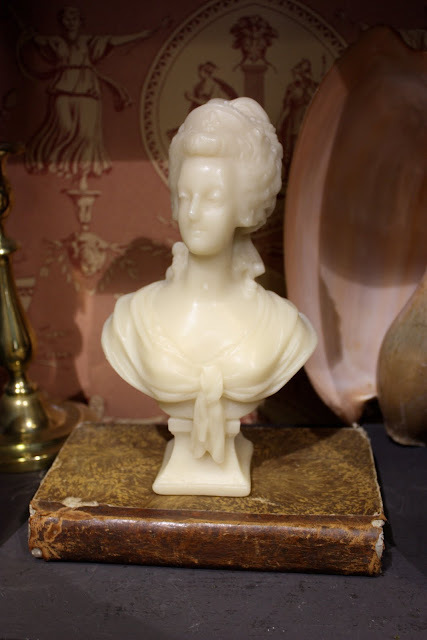 Originally founded by a wax merchant named Trudon in 1643, the French company has changed hands a few times over the four centuries and began it's current retail revolution in 2006 when it furnished the candles for the product-accurate production of Sofia Coppola's film Marie Antoinette. 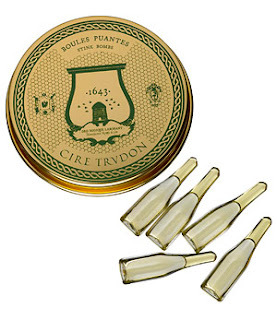 After all, Cire Trudon really did actually manufacture candles for the royal court of Versailles, most churches, wealthy families, and was the official royal wax manufacturer for Napoleon in the 1700's. 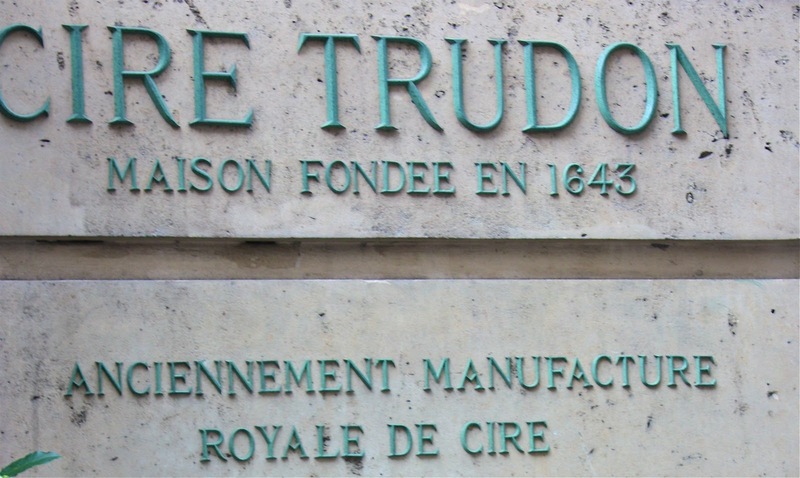 Cire Trudon flamed again in 1948, producing candles for the prestigious fashion houses of Hermes, Cartier, Dior, and Guerlain. In 2007, Cire Trudon was purchased by an innovative man named Ramdame Touhami who has managed to position the oldest candle company into high court, successfully entering the royal court (so to speak) of todays' crowded candle market. If only Marie Antoinette could see them now. Though I am highly fragrance-sensitive and smelling too much scent can quickly give me a migraine (it is not a fair world), I put that potential risk aside in the interest of a good story and let the most knowledgeable sales attendant lift each glass cloche and instruct me to inhale the distilled scent from the inside of the over sized glass cloches. This method of absorbing each individual scent was new to me before attending the Maison et Objet show and I found it a method that eliminated any competing scents. So why wasn't I feeling the typical pain after all that inhalation? 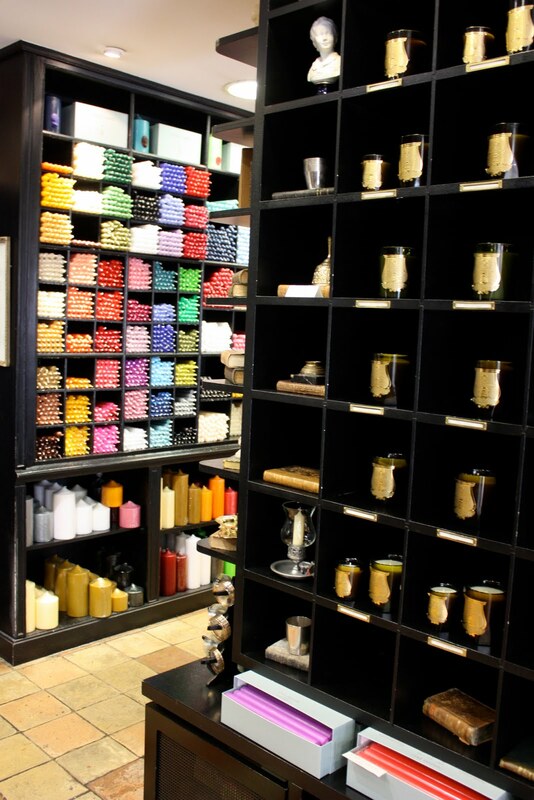 What distinguishes Cire Trudon in today's candle market is a combination of many things. Besides the history, the interior, the service, the packaging, all of which make for a memorable shopping experience. 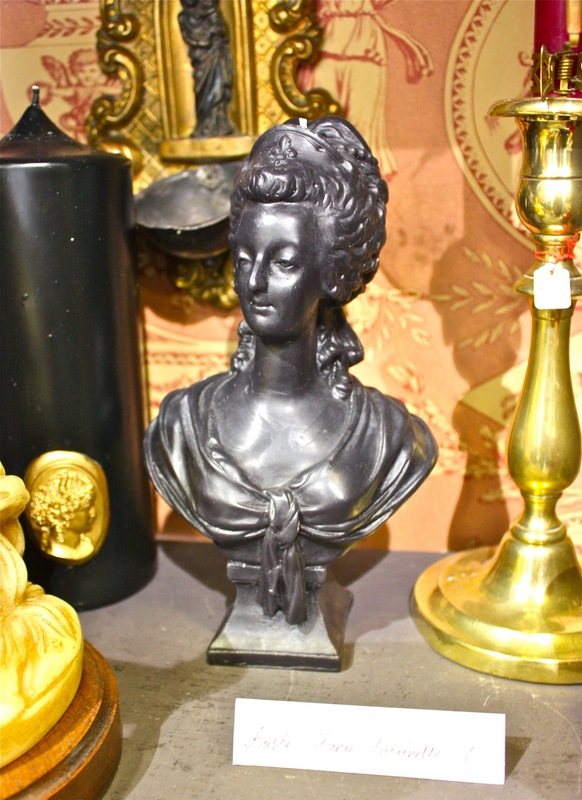 But what sets Cire Trudon apart for me are two things, their unique and classical French bust moulds, and the actual candle quality. Price equals quality in many products and nowhere is that equation more apparent than in candle quality.The top-secret Trudon manufacturing recipe is 100's of years old and it remains the same today. 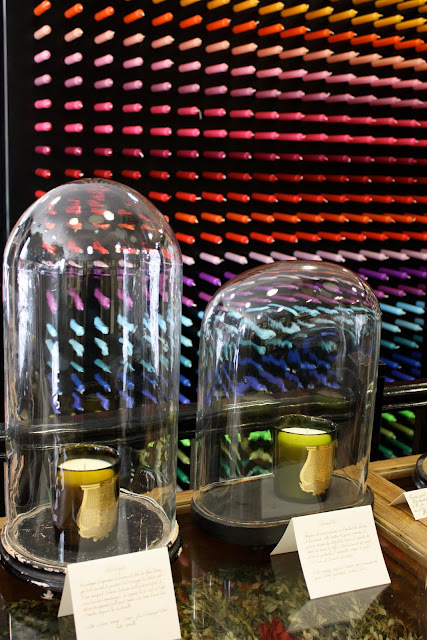 Cire Trudon candles are 100% paraffin-free and devoid of any secondary minerals derived from petrochemicals. Certainly more expensive, but with none of the harmful and dangerous chemicals so painfully-tolerated by many in cheaper brands. That difference is relevant today and I will devote a upcoming post on candles and the latest research in respect to health. 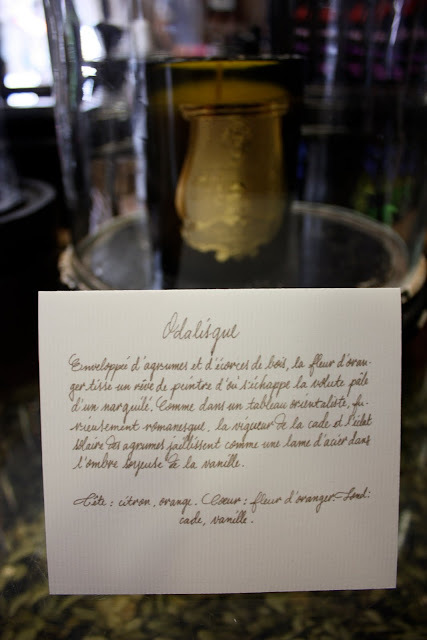 A description of each scent is rendered in gold calligraphy. My absolute favourite. Isn't she a beauty? In bringing back travel treats for my friends I always look for something special, something petite and easy to pack or carry. 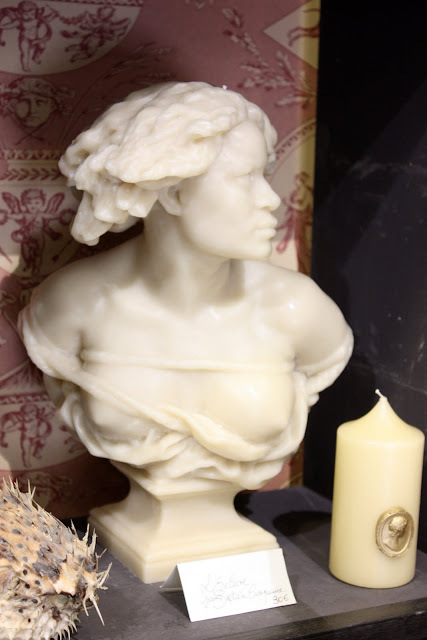 Those petite and colourful votive seen on the front table with the wax cameo were my gift of choice and in order to carefully carry them back I was forced to check my carry-on bag. But a girl has to do what a girl has to do in order to gift her friends with special little treats. It must be the fragrant work environment. Hugo our sales attendant at the Cire Trudon flagship store in Paris (78 rue de Seine) was so charming, so considerate and attentive, certainly he could be one of the shop's best assets along with the product and gorgeous toile-patterned interior. After making my selections, we left my purchases with Monsieur Hugo, went for a short walk and returned to find each of the 14 petite candles expertly wrapped and twisted in black tissue and sealed with the stunning Cire Trudon label. Tucked into my shopping bag was a thoughtful surprise, a generous quantity of their exquisite product book, truthfully a gift in itself. I am sure we were not the biggest customer of the day, but the gracious Hugo made us feel that way. The gold-embossed labels are produced exclusively for Cire Trudon by the oldest champagne label maker in France. The gorgeous Cire Trudon product book has beautiful drawings and descriptive text in French and English, a petite history book if you will. For my larger boxed candles I chose Ernesto as my wintry scent of choice. The masculine scent captured the essence of leather chairs, a roaring fire, rows of books, with a hint of tobacco........the distant whiff of a Havana cigar perhaps. So many titled with clever scent associations, so few hands to carry it all home. A few I was sorry to leave behind........Roi Soleil ~ the waxed wood of Versailles, Spiritus Sancti ~ subtle but unmistakably church incense, and Trianon ~ a floral homage to Marie Antoinette. Take your time, you will be inhaling some remarkable and unusual scents. Feeling like you want to see these waxen busts for yourself? 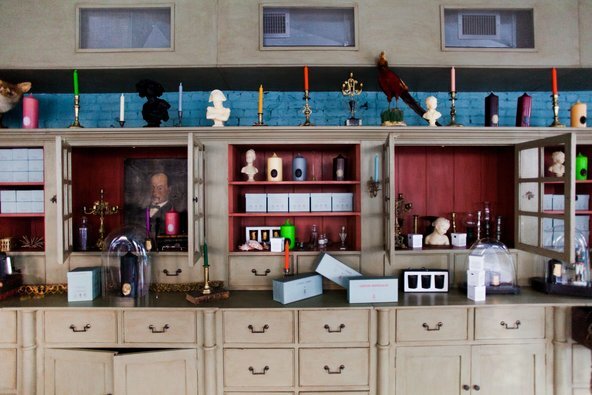 Aren't you in luck if you live in New York where the first North American Cire Trudon shop is opening this week? Here is a press release link from the NY Times. You can also order online at Barneys New York. Though not seen in this photo, antique mirrors were incorporated into the design of the NY store, a reference to the Hall of Mirrors at the Palace of Versailles. As we know, nothing reflects the glow of candles better than mirrors. Due to be launched this November, Cire Trudon is boldly introducing a cheeky but unique entry into the home fragrance market as well. Stink Bombs (no kidding) but done in the most elegant of fashion, something designed to amuse the home fragrance market. Each gold tin holds 5 glass vials, break them open and let the interior perfume blast your home or garden environment with intense fragrance, fashionably stinky in all the right places. 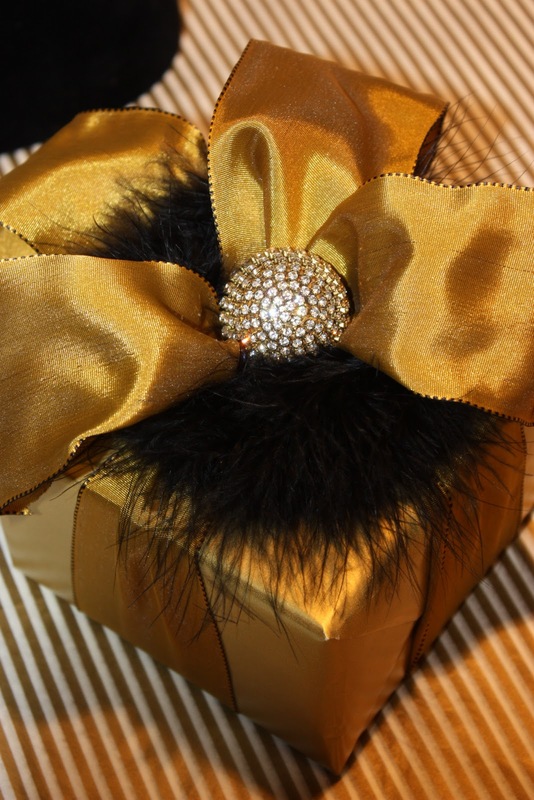 You know that Gilded Glamour Gift Wrap Challenge I gave myself a few posts back? The one inspired by my photo of the Ralph Lauren store display in Paris? The one where I said come back and see the result sometime this week? Just so you know, I had absolutely no idea where this challenge was going to head but I was determined to pull this one off......... even though I was a bit worried after the stated fact. Surprisingly, I don't actually have all that much "gold and gilt" gift wrap materials. 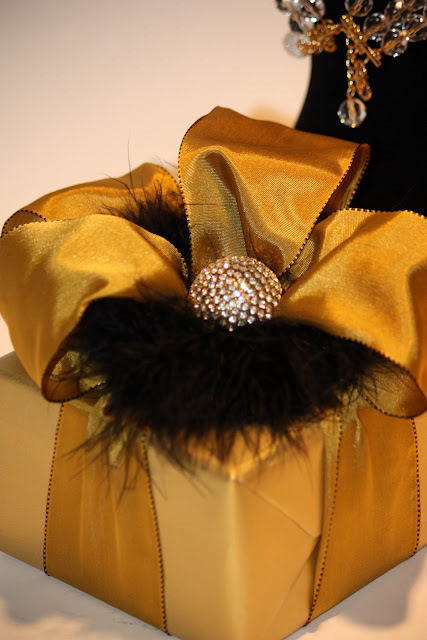 I like gold, I just tend towards working with colours when it comes to gift wrap presentations. But this lack of "gilt" only made me look a little harder, dig a little deeper, and gather some golden inspiration to capture the essence of that Paris salon. This is my Part One of this "gilded challenge" and you will see a few more over the next week, once I started I was really into this gilt and crystal "salon" look and even better for me, it has special holiday gift written all over it. This presentation brought together more than a few of my gift wrap pointers. I used a standard matte gold wrapping paper that I buy in a commercial roll, a burnished gold taffeta ribbon that I bought at a mark-down bin at a craft store a long time ago, a black faux-fur hair scrunchie, and a crystal bauble from my old jewelery stash that I didn't even know was there until I went hunting for something sparkly this morning. It obviously fell off something and luckily had a small eye at the rear that I needed for a secure ribbon attachment. If I hadn't found this I was totally prepared to take apart other jewelry pieces......... actually I did but the "gilt" challenge isn't over yet. You will have to come back to see more. This faux-fur hair scrunchie (and it really is and no I wouldn't wear it) slides over the ribbon knot, pull through the ribbon tails and it really is that easy. Lots of instant volume, almost having a collar effect and creating a nest for the sparkly bauble. I slide through another short length of ribbon and then just folded each of the four ribbon tails under for poufs. No complicated bow-tying needed. This bow-less ribbon style will only work with wired type ribbons, something more readily found during holidays. This was sheer luck to find this crystal bauble, but you could just as easily use a brooch, clasp, or as you will see this next week..........even earrings, with or without their partners. Ina Garten and I have been cooking together for quite some time now. 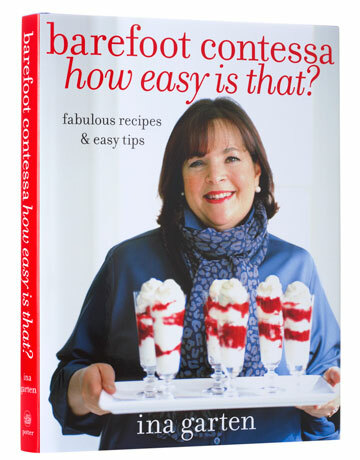 So when I saw that the Barefoot Contessa has a new cookbook How Easy Is That? being released by Clarkson Potter on October 26th.............I thought the timing for holiday gift giving was just about perfect. Good for me too, whenever the Barefoot Contessa comes along with new recipes and all those yummy photographs it always sends me on a bit of a cooking blitz, a good wind-up to the holidays ahead. In my kitchen and during most of the week I follow simple food rules, nothing boxed, nothing white, only fresh vegetables and organic whenever possible. I am less afraid of real butter than I am of food additives and chemicals so Ina and I get along fine. More than fine actually, I use her recipes more than any other cookbook author when it comes to serving up casual and delicious dinners for family and friends. In my kitchen she always delivers exactly what she promised. Ina Garten has her own little section in the cookbook row of my pantry and as you can see by all the tabs (yes, the post-it notes should be more designer looking) all six books are well-used. My family knows the taste and smell of Maple Oatmeal Sconces, Old-Fashioned Apple Crisp, Spinach Gratin, Pan-fried Onion Dip with Home-made Potato Chips, Apple Crostata, Popovers, Turkey Meatloaf (the best), and everyone still requests those Outrageous Brownies. I still don't know which book has which favourite recipe but I just as soon go through them each time anyways. They always make me want to cook more. Just look away if you are vegetarian. 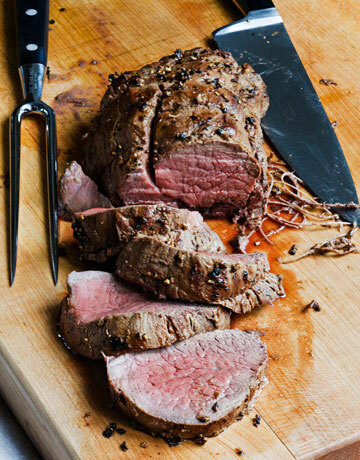 One of her new recipes is Balsamic Roasted Beef along with some other soon-to-be favourites, an oven-baked Risotto, Herb Baked Turkey Breast, and an easy dessert made with store-bought chocolate chip cookies, something like the vintage ice-box cake recipe from what I can tell. Garten says How Easy Is That? was written to be easier and more stress-free, I always thought all the Barefoot Contessa cookbooks were easy and stress-free so how good is that? Gilt, Crystal. Glamour. Glowing. Gorgeous. Something that inspires me to wrap a gift of opulent beauty. Something fabulous, a brilliant blue gift to brighten up your weekend. If you have been reading this blog for a long while you might remember the post I wrote about finding Karen Appleton, the artist who loves to paint gift wrapped packages? Someone who shares my gift wrap passion. I am still so amazed by her subject matter and incredible technique, it makes me shake my head that an artist could be so talented. Karen posted this week about her latest painting titled Look At Me which was selected for a Chicago area art gallery show and competition in November. Maybe if you live in the Chicago area you could go take a peek that evening. And if you didn't read my first post, you really do have to click here to see her oil paintings in all their gift wrapped glory. It is a crazy kind of gift wrap presentation isn't it? When it comes to wrapping up birthday gifts for my friends I tend to go a little crazy and mix it up a bit. Something I have been wanting to do, layer up some crazy patterns, mix it up, have a little gift wrap fun. I kind of like it and I think she will too. If it looks a bit too crazy and over-the-top than I think you would be right, that was exactly the effect I was going for, something a bit outrageous. I am actually being somewhat efficient, using up bits and pieces I keep here in my studio. The bottom red layer is gift wrap of course, but the second layer with the folded edges is a Schumacher sample page from an old wallpaper book. Designers take note, purge those outdated wallpaper books of good patterns, they come in handy for small gift wrapping and layering patterns, something us designers love to do. It reminds me of my designer days. That top layer is a short piece of black flocked ribbon that is quite wide, a short leftover piece that had no hope of being used in any other way. The Paris label and double-sided tape is holding all the layers in position. They all fold across the back too which is where the double-sided tape comes in handy. My point in showing you this presentation effect is to encourage you to do something I always go on and on about in this blog, use up your leftover pieces of gift wrap, put them together, create something that will have a special effect. Experiment a bit when gift wrapping. You might not want an effect this dramatic but the technique can twist in many directions. I am guessing that you have gift wrap choices that can be mixed up this way too. I was looking to give this gift a french feel, something to capture the nature of the gift, a copy of My French Life by Vicki Archer. Do you think it worked? Remember my summer gift wrap camp? This red crystal flower was one of the scrapbook embellishments that I was going to try. You could also use a vintage brooch for this type of gift presentation and it would be truly fabulous. 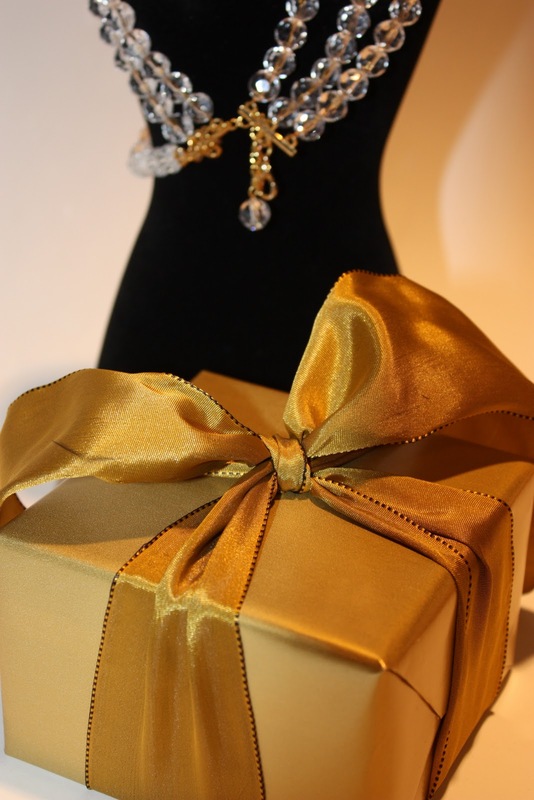 We try to spoil the birthday girl with multiple gifts, prolong the gift opening pleasure, make her feel special. Four friends celebrate each of our birthdays which happen to be nicely-spaced throughout the year. One of them once mentioned dispensing with the gifts and just doing dinner................we all laughed. No gifts once a year, no spoiling the birthday girl? Now that would be crazy. It was pure coincidence that Sarah's Key was our book club choice this month and I will get to that part in a minute. 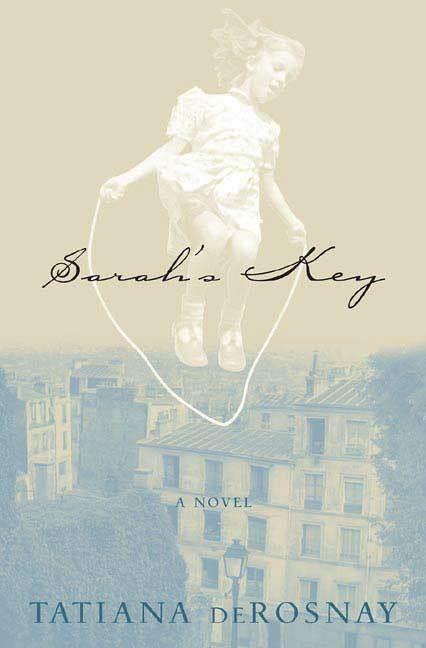 As an avid reader, I had seen this Sarah's Key in bookstores but when I would read the synopsis I would bypass it simply because it seemed such a sad subject matter and sometimes I just can't do sad when it relates to little children. 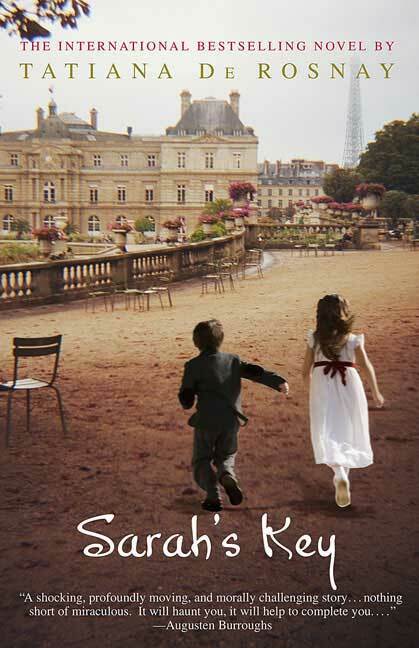 But, I am a diligent book club reader even if I am late to this bestseller and I downloaded Sarah's Key and then noticed that author Tatiana de Rosnay had just released A Secret Kept on Sept. 15th which sounded like a juicy story to ease me into the sad Sarah's Key one. 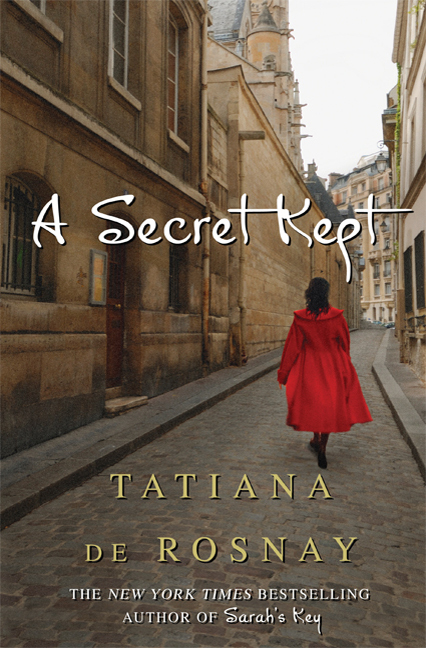 Within a few pages of the newly-released A Secret Kept I was so hooked to the way this author-journalist writes, the history, the characters, the compelling story, all the Paris references, that I was going to read everything she wrote, sad or not. It doesn't matter in which order you read these two books, just make sure you read them............both of them. And when you are done reading Sarah's Key tell me if you see a subtext to this story as well. I am dying to know if I was reading too much of a moral message into the intertwining (past and present) narrative of this story. I say it was coincidence because when I started A Secret Kept I didn't realize that this book club choice would be so perfectly timed to my return from Paris. Both books take place in Paris for the most part (and Noirmoutier Island in A Secret Kept which was fascinating) and I have to tell you I felt like I was still walking down Rue du Bac or through the Marais. Not only will both (or either) books have you turning the pages long into the night, the author compelled me to do several things that tell me it has captured my full attention, take discussion notes, download a book group guide, look up geography, google history, download all her books, turn pages so fast it annoys my husband (the click, click of e-reading on a laptop), hold off the end chapter as long as I can, and feel incredibly lucky that someone made me read these books. And even better, the upcoming Sarah's Key movie stars my favourite actress Kristen Scott Thomas. No US release date yet but it opens in France on October 13th. I am really good at reading, not so good describing them and I don't want to even come close to spoiling it for you. Just trust me on this............and read them both if you haven't already. If you have read Sarah's Key (like the rest of the world) then you know you are going to love A Secret Kept which is totally unique in it's own right. But I am quite certain I don't have to tell you that anyways. Titiana de Rosnay is just one good storyteller. Just head to your nearest bookstore or e-reader store. Personally, I haven't bought a real book since I jumped onto e-reading last spring. Our Canadian bookstore named Indigo/Chapters introduced a Kobo e-reader. It is not as fancy as Kindle (books have to downloaded to laptop, then synced to reader but they just introduced a wireless version)) but in my opinion their e-bookstore is far more attractive than Amazon and I love the look of my colour library on my laptop. Surprise, surprise, Canadian Kobo often has new release e-books not available in Amazon. I would know this because I also download Kindle Books to my Mac laptop. So yes, two e-bookstore sources and a library of books so I will never run out of reading material. The laptop reading method is presently beating the smaller e-reader for a couple reasons: props up in bed nicely, bigger screen, and can check for blog comments (hint) with a click of a tab. Happy reading, however you do it. When it is 79 degrees outside and the sun is shining on Thanksgiving weekend (here in Canada) there is only one thing to do........spend the afternoon on the veranda and look at fashion magazines, specifically the October issue of Harper's Bazaar. We had our turkey, stuffing, and pumpkin pie yesterday and more today so a peek of glamour always reminds me to hold down the portions a bit for the next week or so.You had to know I would feature this fashion shoot especially when it features a chartreuse organza dress by Givency Haute Couture. My favourite colour. And in organza. Really, how often do you see a chartreuse dress that looks this gorgeous? I think you will agree with me that Drew Barrymore as photographed by Mark Seliger is looking more than svelte and ultra- glam in all this fabulous haute couture and on the HB cover this month. In fact, I would have to say she is looking better than ever, maturing nicely isn't she?